Old church records can be a major genealogy research source of information you might not be able to find anywhere else. Prior to the advent of government-required registration of vital statistics (births, marriages, and deaths), churches were the main entity for recording family information. As such, do not overlook their importance in your research. The information that churches kept offers you an interesting insight into local life in many aspects. For many years churches were the heart of the community. In many communities they still are! The church noted the baptisms of its members. Many of these old baptismal records contain the birth date of the individual being baptised - especially children. Marriages of congregants were performed in church ceremonies or held in a home with the pastor officiating. 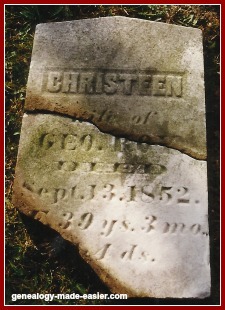 Community deaths were commemorated in funerals and burials from the church. Most early churches had their own burial grounds before the days of municipal cemeteries. If you walk through such burial grounds you can find information about the church members, including your own family ancestors. The pastor of the church entered all of these events in the various registers. In many cases, these records were sent to the church denomination's archives when the local church merged with another, or was closed. So, the archives for this denomination are another place for you to do some searching for your ancestors. When you find information in these records for individuals who are members of your family tree, you will make note of it. You will probably put the facts about your family members in a genealogy software program. You also need some organized way to keep track of what research you have completed in various church archives, and what you still need to do. This requires the use of some sort of forms. Don't forget to record the source information so you will be able to put it into your tree. That way everyone knows where you found this information.